Bats can be found all over the world, with the exception of the poles and some remote islands. Bats have been around longer than man-kind, the oldest fossils of bats are estimated to be over 50 million years old and therefore it should come as no surprise that, throughout history, bats have been widely featured in art all over the world. While to many people they may not be as charismatic as birds or larger mammals, bats in art have been depicted in a variety of ways: from demonic beings, to enemies of kings, and creatures of good fortune. To provide inspiration for the Bat Week Art Exhibit, here are some examples of bats featured in historic art. 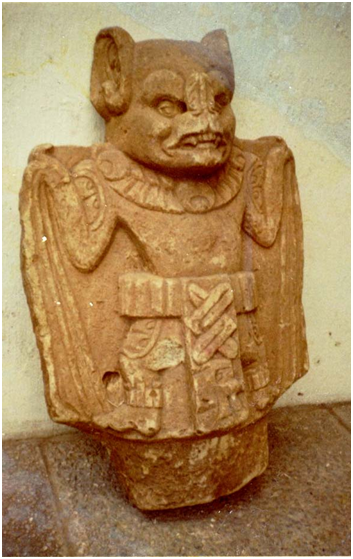 Perhaps the oldest depictions of bats in art were clay statues of the ancient lowlands Mayan bat god ‘Camazotz’. Camazotz means ‘death bat’ and is a demonic creature of the underworld, depicted as a human-sized vampire bat – a bat species native to Central and South America only. During the day Camazotz was believed to turn into a stone statue, but at night he wreaked havoc with his army of demons. Camazotz took residence in a cave by the name of ‘house of bats’, with walls covered in blood. The bat god is most often depicted holding the remains of one of its victims in one hand and a knife-like object in the other. It was even believed that Camazotz wiped out entire human civilizations. Some old clay statues remain and are kept in museums, mostly in Central America. The cult of Camazotz began around 100 B.C. and some statues recovered by archeologists are thought to date back to 300 A.D. It is not unlikely that early European vampire stories, like Dracula, were based on Camazotz. There are certainly some parallels between the bat god and vampires, both being associated to vampire bats, being bloodthirsty, and only active at night. Real vampire bats however, are small, weighing no more than 50 grams. They don’t drain their prey from all their blood but only take a small amount. They generally feed from live-stock and leave people alone. 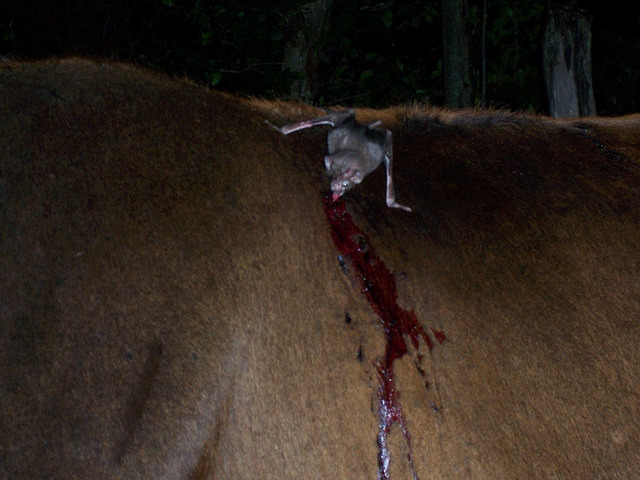 Some vampire bats live in large social groups, taking great care of each other by feeding blood meals to the weaker individuals of the colony. This decorated bowl dates back to the 12th century and belongs to the native American Mogollon culture of the Mimbres region. 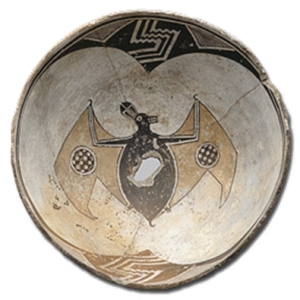 Pottery from this region has a distinct style with black painted geometric designs of animals, people, and cultural icons. These bowls were often found with a hole punched in the centre, associated with burials. The holes, referred to as ‘kill holes’, were deliberately punched in the bowl when placed over the head of a deceased person, to allow the spirit of the dead to escape the body. This bowl represents a Townsend’s big-eared bat. 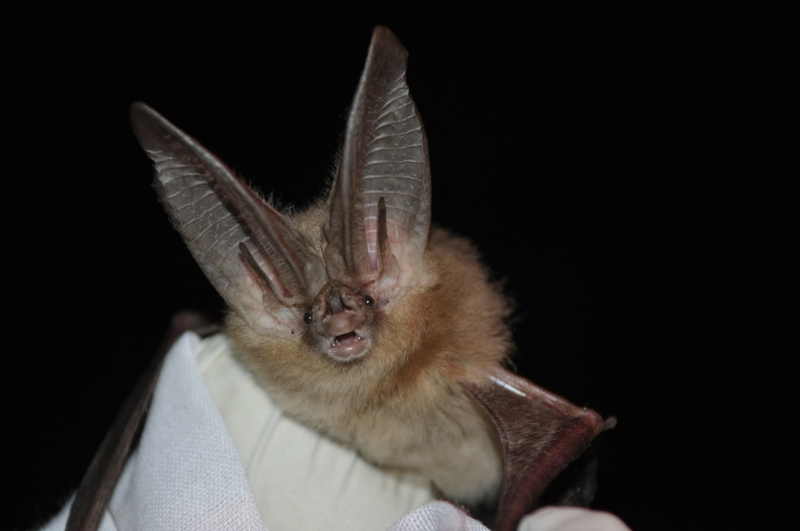 The Townsend’s big-eared bat is a small species, weighing up to 14 grams, native to western North America. They hibernate during winter months and feed on insects in summer. 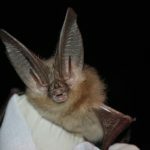 While large ears do reduce flight speed through drag, some studies indicate that big ears on bats can actually increase lift during flight when angled right. “Le Livre et le vraye hystoire du bon roy Alixandre”, is an illustrated book from 1420 about the history of Alexander the Great. 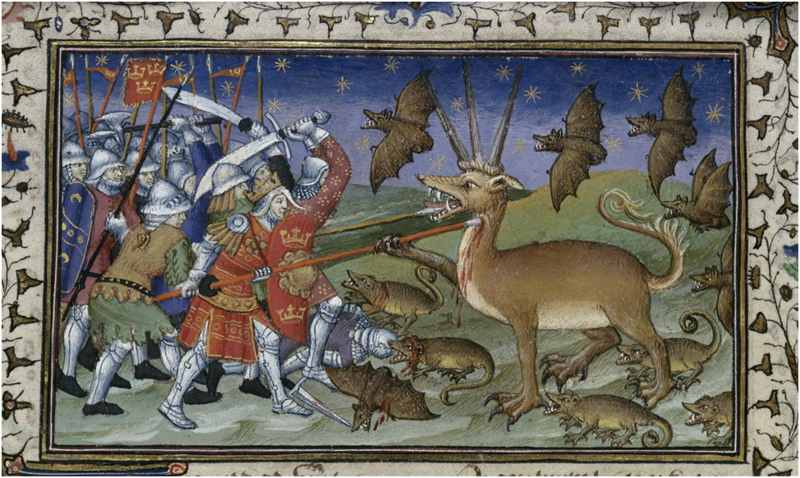 Alexander the Great can be seen battling a large, three-horned beast, while surrounded by rats and bats. While the context to this panel makes no mention of bats, other literature on Alexander the Great does state about his amazing feats: “He wrestled an Indian monster larger than an elephant, fought ants the size of foxes, and contested bats with human teeth” (from “Legends of Alexander the Great by Richard Stoneman). This statement would explain the artist’s interpretation of Alexander the Great battling bats amongst other foes. The design of the bats is very similar to that of the rats, with only the addition of wings and the absence of a tail. In reality though, bats are not closely related to rats. Like rats, they are mammals, but rats are rodents and bats have their own group called ‘Chiroptera’. 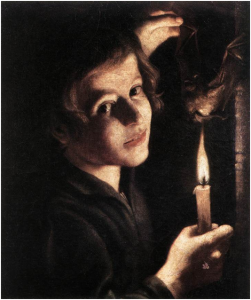 “Boy singeing a bat’s wing” is a piece prominently featuring a bat. This is an oil-on-canvas done by Trophîme Bigot in the 17th century. Bigot was considered a painter of nocturnal pictures and many of his pieces show dark sceneries illuminated only by candlelight. This piece is found at the Galleria Doria Pamphilj in Rome. Whatever the purpose may be of singing bat wings, this piece is current still today, with people actively persecuting bats all over the world or subjecting bats found in homes to cruel practises, often for reasons resulting from ignorance and fear. When a dead bat is found, contact your local fish and wildlife department. They may be interested in submitting it to a wildlife health lab, such as those of the Canadian Wildlife Health Cooperative. The Allegory of Air, currently found at the Galleria Doria Pamphilj in Rome, is part of the Allegories of elements: a four-part oil on copper painting series which includes Allegory of Earth, Allegory of Water, and Allegory of Fire. These works were a collaboration between Jan Brueghel and Hendrik van Balen and date back to around 1611. 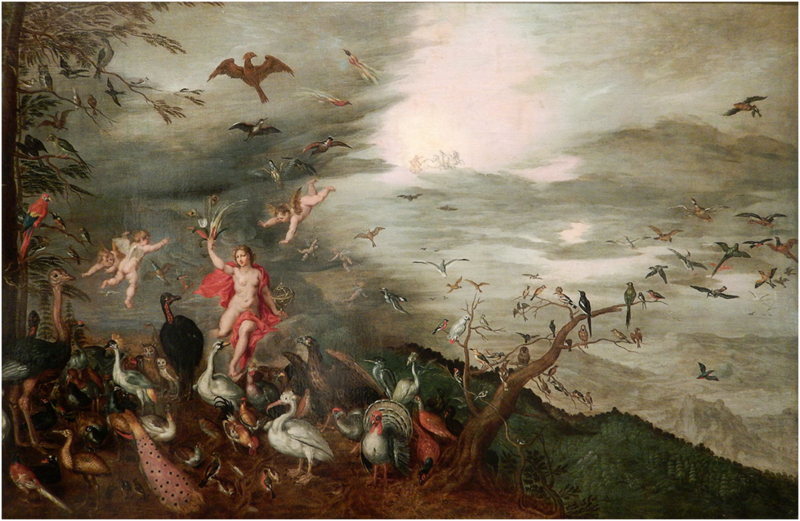 Many different bird species can be seen in this painting, but among the birds are also several bats. In the early 17th century, bats were often not considered amongst the mammals, but rather classified as birds. Nowadays we know that bats are mammals: they have fur and they give birth to live pups which they feed milk from mammary glands. Unlike most western cultures, where bats have been associated with darkness, bloodlust, and demons, in Chinese culture bats are perceived as beautiful animals, being strongly associated with happiness. The Chinese word for ‘bat’ sounds very similar to their word for ‘happiness’ and the bat is a symbol of longevity as well as an embodiment of the active forces (flowers and fruit are the embodiment of passive forces). In Chinese art, five bats are often presented together, representing the five blessings: health, prosperity, long life, love of virtue, and a tranquil, natural death. 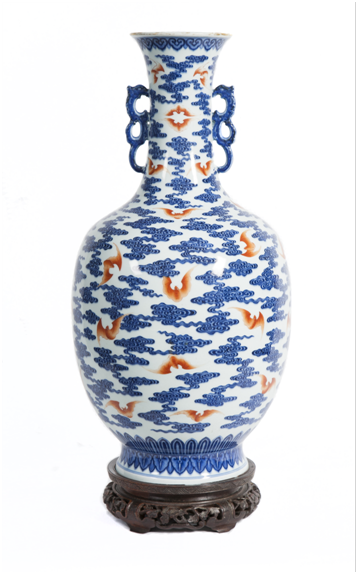 The porcelain vase shows red bats among blue clouds, which has been interpreted as the prospect of a long and happy life that is as great as the heavens are high. Porcelain was invented in China nearly 2000 years ago; however, this imperial vase was made around the mid-1700s and is on display in the Utah Museum of Fine Arts. Bat Week aims to educate people about bats; to show bats as the amazing animals they truly are. By fighting ignorance about bats, hopefully we can all have an appreciation for bats similar to that in Chinese culture. These are just a few examples of the many ways in which bats have been featured in art throughout history and different cultures. Submit a photo of your own bat art to the official Bat Week Art Exhibit and use the hashtag #BatWeekArt! For a chance to win a beautiful piece of bat art, don’t forgot to like the post about artist Ashley Anne Clark on the CWHC Facebook page! Contest closes the morning of October 31st, 2016.